The idea of co-constructing knowledge with students can be a scary thing for many of us teachers. The age-old role of teacher as orator, director, sage has been handed down for centuries, and most of us grew up as students looking to teachers in this way. It’s hard to shake. Co-constructing knowledge means giving up the myself and them role of teacher and students and fully embracing the wonder and journey of us. We all just sat there in the silence of those three words. Then I said, “Who knows something about this that they can share?” A few students shared some ideas and thoughts they had about the topic. I followed their comments with, “Who wants to find out more?” Several hands went up. Two educational theorists who inform my thinking about co-constructing knowledge are Vygotsky and Freire. Both saw learning as a social act in which teachers and students dialogue and create knowledge together, rather than teachers filling the students with content and information as if they were empty vessels. Yes, it is true that teachers need to be the ultimate decision-makers about a lot of things. This is not proposal to share authority and control with students. Consider it instead an invitation to take a step to the side and see what can happen when we shift our perspective and delve into some experimentation. I’d like to propose five ways to get that ball rolling in transforming the learning space you share with students into a place where you serve often as facilitator and guide—and when needed and necessary, as presenter or instructor. 1. Stuff we want to know about: Brainstorm an ongoing class list of stuff they want to know about and are interested in—a phenomenon, an event, or a law, for example. If you are a science, math, or history teacher, you can ask that it be about your field, but I also encourage you to have it be about anything (and then you can find connections to content later). Inquiry is a skill all teachers should build regardless of content. 3. Assessing their needs and wants: We should never underestimate the power of the five-point Likert scale as a quick, quantitative measure to see where students are. 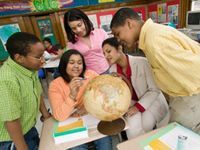 You can create several statements for a unit of study to gauge student interest first, and then their understanding and experience with the content, materials, activities after. Consider including a couple fill-ins and evaluate the responses for patterns and repetition. Use both the tally of numbers from the Likert and the fill-ins to inform your planning. You can say to students, “I tallied the numbers and there were twelve 5s and eleven 4s, so that tells me _____ is very important to most of you. We are going to explore that next together. However, in ranking how well you understood writing a thesis statement, the majority of the class selected 1 or 2, so we’re going to spend some time reviewing and practicing thesis statement writing." With anonymity, students tend to be more candid and honest, so make including a name on the survey optional. 4. Think-alouds: Model for students your learning as you read aloud an article on a current event or a topic of study. For example, as you read, pause, asking questions and making comments and connections to things you already know or even things you’ve explored as a class. Have students do the same with a partner, then eventually in groups of three or four. For high school students, I like Kelly Gallagher’s Article of the Week, which he uses with his students. Building the prior knowledge of students is also part of our job—and not just knowledge about the content we teach, but also about the world. 5. Project options and self-grading: Think about how these two sentences sound: “You will have several projects to choose from” and “You will create a trifold poster....” They might remind us that no matter the age, we all like to have choices, especially when it comes to demonstrating our skills and abilities. So offer up plenty of options in types of projects and also collaborate with your students in creating a criteria chart for each project. Having more of a stake in the work, students can use the criteria to grade themselves in the end. Be sure to include an opportunity for them to also do some reflective writing on why they’ve assigned themselves that grade. Learning tends to stick better when we reflect. Less teacher talk and more student-centered learning makes for a happy, healthy, and productive learning environment.